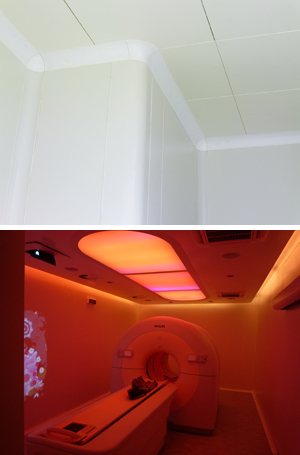 The MEDICAL LAB CEILING® false ceiling ensures perfect levelling of the panels and prevents the false ceiling from moving in case of doors opening which may cause depression in the setting and combines the performance of a monolith ceiling and the advantages of an false ceiling available for inspection. In the MEDICAL LAB CEILING® false ceiling complementary elements may be added: luminaries, ISO 7 and ISO 5 see-through ceilings, surgical cabinets and scialytic lamps. STRUCTURE- The false ceiling is made up of a woven hidden bearing structure which allows, upon request, for the housing of the seal. FINISHING – The system uses 600×600mm steel box girders, with chamfered or cut edges, with a smooth, non-pierced epoxy-painted surface.